Rin is rooted in over two decades of exposure to a diverse array of movement styles, including belly dance, jazz, hip hop, ballet, and contemporary. In 2007, she entered the world of belly dance through classes in Washington, D.C., at Sahara Dance studio, founded by Rachel Kay Brookmire. As curiosity accelerated, Rin began expanding toward more contemporary styles of fusion in belly dance and beyond. 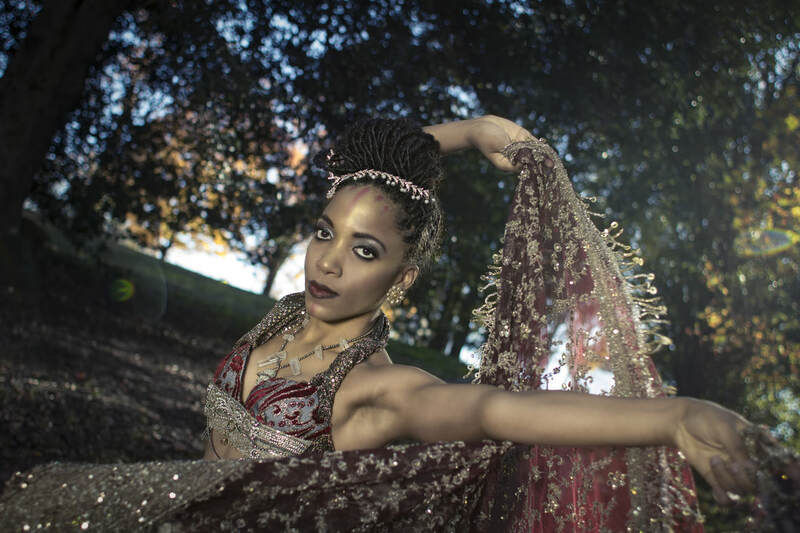 From 2010-2013, Rin danced as a member of Raqs Caravan Urban (RCU), a high-energy urban fusion troupe based at Sahara Dance and directed by Ebony Qualls. She additionally worked to hone a technical foundation for Tribal Fusion style belly dance through extensive training with Rachel Brice of Portland, OR, in her 8 Elements™ program and various intensives. From 2012-2017, Rin danced with Jillina's theatrical production, Bellydance Evolution (BDE), through various casting competitions. She eventually contributed choreography for their unusual rendition of Alice in Wonderland, as well as their newest touring production, Fantasm: Odyssey of Dreams. Rin has since come to find her own voice in dance with an evolving style she currently describes as "experimental" fusion. Her evolution in style and curiosity continue to grow exponentially, with a dynamic spectrum of movement that often reaches beyond genre-specific dance. Her energy and movement are most often described as “otherworldly.” With the intention to remain as focused, generous, open, and compassionate as her instructors, Rin now teaches her eclectic style across the country and internationally. Rin draws deep inspiration from the elements of nature and the power of music, which have led her on a path of creative exploration. Piano has always held space in her life, and while she has never quite clung to classically-accepted forms of musical notation, her passion for composing and playing music by ear only continues to grow. In recent years, her musical ear has brought her on a new journey of composing music electronically. In 2015, Rin formed Myriad, an experimental fusion dance project featuring artistically diverse casts of dancers and set to original, electronically-composed music. Myriad opens a world of opportunity for Rin to experiment with her love of music and dance composition with a group of open-minded dancers from around the world. Rin’s excitement for larger group projects and long-term collaborations has also led her to choreograph for performance intensives for large productions such as Oceanic and Eternal Forest, directed by Twila Jane Sikorsky of Electric Nomad Dance. Through learning, teaching, and collaborating, Rin continues to share her appreciation for movement and its inevitable connection with all aspects of life. As her career unfolds and develops, her gratitude grows more immense. With this in mind, she works to foster environments in which dancers can feel personally inspired by curiosity to develop their own vision.